In the initial steps of constructing a BowTie, Top Event, threats and Consequences, are defining the Risk Environment itself. Supporters of the BowTie concept have accepted that they will mainly intervene with the Risk Environment, to maintain safety above an acceptable level. According to them, the risk environment creates the error-producing conditions and those need be managed, as it is normal for people to make errors. All high-risk industries, by definition, operate as systems with tight coupling and high interactions among their elements, in such numbers of combinations that deprive organisations of identifying connections that finally will turn to be threats, with a 100% accuracy. Unfortunately, there are occasions where risk management process cannot identify all threats, which immediately lead into the loss of control and the release of the top event. 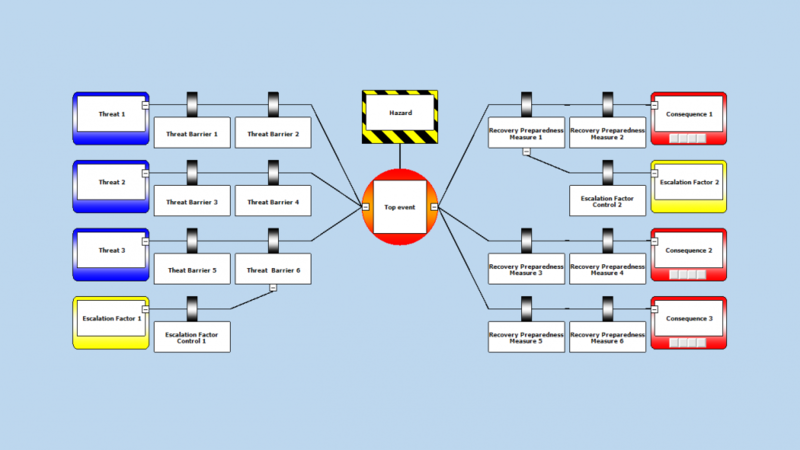 Those situations are expected to happen rarely and are related to the level of effectiveness of the designing of the hazardous operations in the first place. 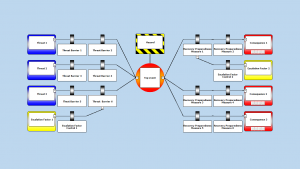 Barriers and controls of this first level of defence as being selected and implemented just after threats and before consequences, play the role to controlling the current risk environment (stopping threats from releasing the Top event) or at least of effectively mitigating all its unpleasant consequences. In this level, barriers and controls shall be employed as deliverables of formed training schemes and procedures built in the past. The real problem arises from the fact that real world is not ideal; instead, “Reason’s cheese slices are full of holes”, the holes called escalation factors by BowTie theorists, reasons that demise the effectiveness of barriers assigned to safeguard risky operations. In this level, barriers normally fail due to an error attributed to one among the front line operators (pilot, engineer, captain, driver, etc.). This kind of failure gives to the Organisation the opportunity to once again delve into its risky area of operations and pinpoint all possible reasons and causes that may decrease the abilities of selected barriers to perform as planned. It is either the prevailing state of Safety Culture of the entity that will assist them to discern all the “holes in the slices” or its absence that will deprive them of finding the reasons that decrease their defences. Culture is a sustainability tool. Once positively established it will affect safety not only here and now but also far into the future. When a culture develops safety practices, those practices become a norm that adapts and perpetuates in amazing ways. The Safety Culture mixture itself provides a set of capabilities that enable continuous improvement in safety performance and creates a chemistry and climate in which such improvement is nurtured and encouraged. In the case that the prevailing Safety Culture is characterised by the correct attributes in line with the high-risk operations, the endorsement of BowTie produces elaborated results in the implementation of the methodology. Those outcomes are essential for identifying all escalation factors and most importantly their escalation factor controls, in the organisational part of systemic brainstorming that favourably will end up providing all answers to fortifying its Safety management System. A potential endorsement of BowTie will definitely positively influence the Safety Culture of the entity that will rely its risk management on it, as soon it will be realised that poor BowTies without extensive use of escalation factors and their controls cannot be acceptable. The initial difficulty of the organisation to create useful ideas for mitigating “the holes on the cheese slices” will be followed by a surge of ideas, as long as the culture continuously evolves. BowTie functions not only as a risk assessment methodology, but also as a common language to discussing about hazards. Therefore, it is so effective in communicating risks among the members of each endorsing organisation and respectively to activating their intuitive awareness, which produces extraordinary ideas and makes its acceptance high. Unfortunately, investigation reports of systemic accidents still unveil examples of high risk operations which had taken place without the established risk scanning process have reaching safe conclusions about potential escalation factors. Failure to in time identification of them is a sign of a non-functioning Safety Culture and every potential absence of effective escalation factor control portrays gaps in the culture itself, plus a portion of regulatory responsibility. 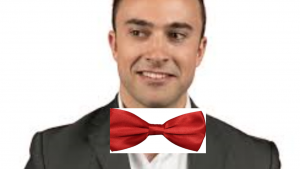 In seems that BowTie as a concept was founded not only to provide us with a selection in risk management, but additionally, to serve as an instrument “to stirring” the Safety Culture, to infusing values, to cultivating positive attitudes not only at the junior level of the front line operators but most importantly to the senior level of management. Safety accountability is definitely enhanced as long as the key guards of safety in any high reliability organisation realise that risk management is a team effort task that entails a moral consent for positive contribution by everybody. The latter explains the BowTie trend momentum we are living in lately. Is it the time perhaps to wear a Bowtie?